2018 FIFA World Cup: How should Russian cities prepare for the tournament? In four years, Russia will host the FIFA World Cup, one of the largest sporting events in the world. Experts in logistics, the hospitality business, and sports marketing commented on Russia’s preparations for this grandiose soccer event, including the challenges that will face the host cities, what they need to concentrate on, and what they should avoid. 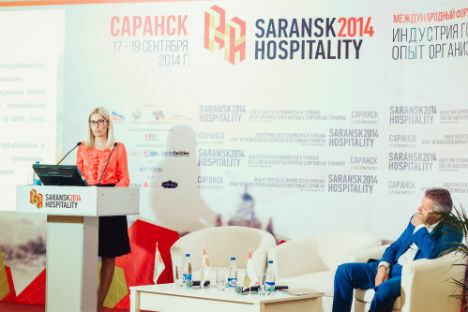 On September 17-19, the Russian city of Saransk, located 400 miles south-east of Moscow, hosted a forum for specialists on preparing and hosting large sporting events. The event was dedicated to the 2018 FIFA World Cup, which will be hosted in 11 Russian cities, including Saransk. At the forum, RBTH asked industry professionals and those with experience of organizing previous World Cup tournaments about the most important aspects that Russia will need to focus on in its preparations for this major event. Whereas only one city had to be tested for durability in the run-up to the Sochi Olympics, almost the entirety of Russia will have to be inspected for the FIFA World Cup. “The transport conditions in Russia are similar to Brazil, the previous World Cup host, so visitors will face similar problems. They will need coaches, trains, and a good information system,” Stefan Schmied, a German logistics expert and transport and hospitality consultant for the 2010 FIFA World Cup in South Africa, told RBTH. “Still, Russia has an advantage that it is closer to Europe. Russia has a good railway system that perhaps could be improved with more new nice trains. You have to improve signage on the roads – it should everywhere be in English,” added Schmied. Another crucial task for the Russian host cities will be to modernize their existing hotel infrastructure and create new infrastructure. Experts warn, however, of the danger of overproduction. “Experience from the Sochi Olympics showed that plans that are too large in scale can create big problems for the regional economy. Even in February 2014, hotel occupancy was no more than 50 percent in Sochi,” said Yekaterina Yanut, a real estate valuation specialist at the company EY (previously Ernst&Young). “We need to tailor to the needs of each specific city, while taking FIFA norms into account. Otherwise, we will inevitably end up with a so-called ‘white elephant’ – infrastructure that goes unused after a major event is finished. A classical example is Athens, where a number of facilities were abandoned after the 2004 Olympics,” said Yanut. However, even solid sporting and transport infrastructure does not guarantee success. Every host city should understand what it is going to offer its guests. “To succeed you have to have a plan not just for the World Cup, but for 15-20 years for each city,” said public utilities consultant Winfried Nass, who in 2001-2005 headed the 2006 FIFA World Cup staff in Germany. “For example, in Frankfurt we started to rebuild the city in 2000 and completed it just a couple of years ago, long after the World Cup took place,” he said. Mike Lee, a British specialist in strategic communications in sport who helped promote the city of Belo Horizonte in its preparations for the World Cup in Brazil, thinks a host country’s success is based on vivid campaigns by individual cities. “It is not just Russia that suffers from a problem of focusing on one or two big cities; in the UK the huge focus is just on London, in Brazil the focus is picked on Rio and Sao Paolo. The history and culture of Russia is so varied, so many different traditions, cuisines, ethnic groups, so many things to see - and that becomes the part of the story, let's call it the national narrative. And this story is often best told by the individual cities and regions,” Lee told an RBTH correspondent. In pursuit of a memorable cultural program, however, cities should take into account their financial realities, said Spanish urban studies and logistics expert Paul Freudenspung. “There is no single implementation scheme from the past events in Germany and Brazil that will definitely work for Russia. But in general people come to experience the World Cup, and there are things that are universally attractive - former players’ autograph sessions, music festivals, etc. “The other thing is resources that you have at your disposal. You have to be realistic and also look at the supply side. Perhaps local talents may be very attractive for the audience,” he said. Freudenspung also noted that some things are impossible to plan in advance: “You have to be aware of the draw - which teams will play in your city. Some games attract huge interest, some don't. If tens of thousands of Dutch or French supporters move to your city, the program will be different than if you get Slovenia and Paraguay playing. “That is a very important aspect, but the trick is that you will not know the results of the draw until 2017,” Freudenspung said.